“Please accept my sincere thanks for your extremely informative and helpful talk. In the hands of a less experienced professional, the subject matter may have been difficult to get across so successfully, but your well honed talk with personal asides went down really well and was greatly appreciated. “I just wanted to put in writing how incredibly impressed I am with the way you look after your clients. Your style is incredibly proactive, efficient and clear, whilst keeping a personal empathetic touch that makes all the difference to what could be potentially stressful processes. Your handling of my house sale , and subsequent house purchase has ensured there has been no stress whatsoever, and I really feel I have someone who I completely trust, really cares and treats me as an individual acting on my behalf. All that, and your pricing structure is very competitive, clear and fair. I will certainly be recommending The Waring Partnership to everyone I know – thankyou! “Thank you very much for your hard work! We will definitely recommend your excellent service”. 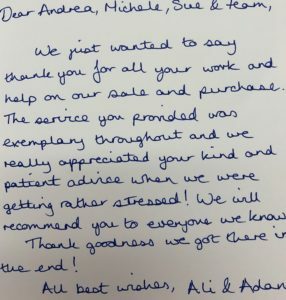 “Just a note to say a special Thank You for your extremely professional help and guidance through our recent purchase of our new home. “Thank you for all of your assistance & help during the purchase of my new home. At no time did I ever feel worried or stressed as everything progressed without any issues or problems whatsoever. In future I will recommend your practice to others without hesitation, as the way you kept me informed throughout the purchase could not of been bettered. “Andrea Waring was recommended to us in 2001 when we were buying our first investment property. As well as handling that purchase, she has since dealt with the purchase of two further rental properties, the sale of a rental property and the purchase and sale of two of our homes. We also fully intend to engage her services for future transactions.